Slot machines are a colorful part of Americas history. This uniquely American invention has gone on to take over the world of casino gaming, even propagating to bus terminals, lounges, and pubs in England, they've become hard to avoid. The beginning of the history of slot machines starts with its inventor, Charles Fey. Fey's invention came about 1895, and by 1907 Fey had teamed up with the Mills Novelty Company to produce the first bonafide slot machine, the Mills Liberty Bell. The Liberty Bell featured a cast iron case, with a Liberty Bell embedded on the front of the machine. The machine's reel selections had pictures of playing cards (hearts, spades, diamonds). The fruit machine wasn't far behind. In 1910 the Mills Company introduced a slight variation to the Liberty Bell and called it the Operator Bell featuring the now famous fruit symbols. Sources have it that over 30 thousand of these cast iron machines were made, up until about 1915, when wood cabinets were introduced to help control costs. Over the next couple of decades the Mills company made numerous changes and alterations to the machines and to the game itself. Multiple jackpots, quieter running machines, colorful cabinets to attract players, and eventually specific themes. The phenomenon that is still keeping the history of slot machines fresh, themes, began at this time and hasn't looked back since. Some of the original themes included the 'Roman Head', the 'Castle Front', the 'War Eagle', and the 'Lion Head'. Electronics reared their ugly head when the sixties rolled around. Nevada Electronics' solid state "21" machines were a big deal, and by the mid-1970s, other manufacturers had built solid state 21, dice, roulette, horse racing, and poker machines. The most successful of these was the Dale Electronics' Poker-Matic, which could be found in most Nevada casinos. 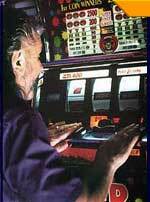 In 1975 the Fortune Coin Company introduced the first video bell slot machine in Las Vegas. The new machine received only mild acceptance by the casinos, which purchased it primarily as a novelty. It wasn't until it was converted to a draw poker machine that it's potential became apparent. In 1976, Bally built a black and white video poker machine and eight months later the Fortune Coin Company returned the favor with a color version. A new slot manufacturing giant, founded by Willion "Si" Redd, showed itself in 1975. After selling his Nevada Distributing Company to Bally Manufacturing, Redd arranged for $1.5 million to be subtracted from the purchase price so he could keep the rights to the electronic games, including video slots. Redd's new company, A-1 Supply, soon acquired pioneer video game manufacturer, Nutting Enterprises, and began building BlackJack and Draw Poker console machines. The company flourished, and William Redd changed it's name to Sircoma (Si Redd Coin Machines). In 1981 Redd's company underwent another name change, this time to IGT (International Game Technology).